A man who took a woman hostage has been subdued and detained, police say. GERMAN POLICE SAY that they have subdued and detained a man who took a woman hostage in a pharmacy in Cologne’s central train station. “The perpetrator is under control. Police measures are continuing,” Cologne police wrote on Twitter after commandos had stormed the shop. “A female hostage has been lightly wounded and is being cared for,” they added, calling on the public to keep their distance from the area. The hostage-taker also suffered injuries, a police spokesperson said, adding that the man’s motives were not yet known. An AFP correspondent at the scene said he heard two stun grenade explosions as police stormed and secured the pharmacy. Several heavily armed officers from a special response unit were seen immediately afterwards running across the Breslauer Platz square, on the opposite side of the tracks from the city’s famous twin-spired cathedral. Earlier today eyewitnesses had reported hearing shots and possible smoke bombs being let off inside the massive station, which hosts many shops and cafes. But police could not confirm any details as they rushed to evacuate the building. Officers had later been in touch with the attacker to determine his demands and whether he was armed. 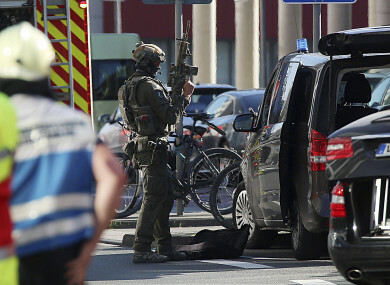 Email “Hostage-taker detained after commandos storm German rail station ”. Feedback on “Hostage-taker detained after commandos storm German rail station ”.